Without a doubt, you have heard about roofs collapsing from the weight of the snow over the past few weeks, but there are other dangers to be aware of throughout the winter. Another potential issue that you can face are ice dams. 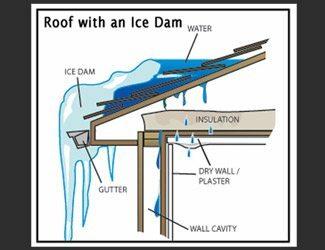 Ice dams are caused by inadequate insulation that can cause water to back up into your wall cavities and can even stain and damage your ceilings. If you have any questions about your roof, including snow removal or ice back ups…contact us.